Embedding data into every action. Engineering enterprise Data Fabric for analysis, discovery and insights. We believe that a data-driven mindset is key for exploring new business possibilities and extracting intelligence from existing and often disconnected data assets. Today, data and digital engineering are at the core for our customers while negotiating industry turns in the shifting business models. Impact of enterprise digitalization is a direct function of speed at which the enterprise can process data and deliver contextual analytics at the point of decision making. Through our proven approach and expertise, we embed data and intelligence into the fabric of our clients’ business processes to deliver intelligence that unlocks new revenue growth and cost efficiencies at unprecedented agility and scale. We assess your current strategic drivers, analytics capability maturity, current state of data assets, data management processes and tools to help create a data strategy that will set the foundation for Analytics. We help you build a strong foundation with the right strategies, processes, and custom-fit platforms to best manage your data. We build beautiful, intuitive analytics dashboards that empower your employees to easily explore and access the information they care about. 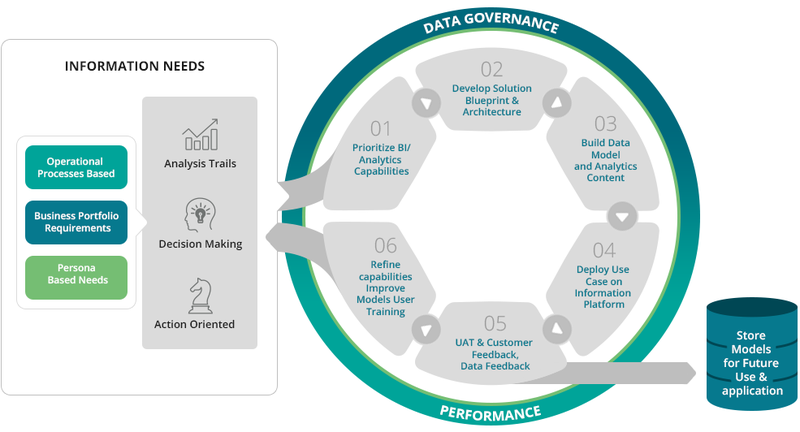 This iterative agile framework is designed to meet customer’s BI and Analytics needs across variety of Use Cases addressing Business Portfolio, Operations and Personas. The framework will be applied in quick bursts and Enquero recommends an iterative methodology to realize value at regular time intervals.